What is the right size air conditioning system for my home? Various factors come into effect when determining the sizing and specifications of your system. Things such as square footage, insulation, window surface and configuration, exact location of your home, and duct sizing and arrangement all play a role in determining the correct size unit for your structure. A Trident Air Conditioning and Heating technician can perform an in-home load analysis to verify which equipment combinations will precisely suit your home and your family’s needs. A one ton of air conditioning can cool anywhere from 300 to 800 square feet, depending on the construction of your home. You can confirm that the system you purchase is the right size by having a professional from Trident Air Conditioning and Heating assess your cooling requirements. SEER, or Seasonal Energy Efficiency Ratio, is an efficiency measure that is used to rate both air conditioners and heat pumps. The greater the SEER number, the greater the efficiency, which leads to increased energy savings. Under current United States regulations, all new products must operate at a SEER rating of at least 14.0. Having regular A/C maintenance by a reliable contractor like Trident Air Conditioning and Heating is a significant factor in preparing your system to perform at its best during Florida’s year-round hot weather. With the demands that long summer days can make on a system, regular service is vital if you want to avoid unnecessary equipment failure and repair costs. 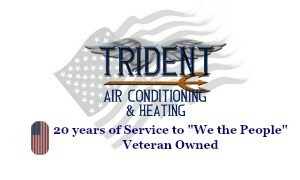 It’s a good idea to have a Trident Air Conditioning and Heating technician check and service your air conditioning system every spring and fall. Standard filters work to keep your system and its ductwork clean, however these filters can only do so much to improve indoor air quality. If you are concerned about trapping small particles, a media air cleaner may help. Media air cleaners rest between the main return duct and the blower cabinet and will improve dust and particle removal up to seven times more effectively than a standard filter. Upgrading to a pleated media filter will remove everything from dust to airborne viruses from the filtered air. It is important when choosing a filter to always select a filter that matches your blower’s capacity. Programmable thermostats are more accurate and efficient than thermostats which contain mercury. These thermostats allow you to program settings in advance so that you can control the temperature at different times of the day. By scheduling your programmable thermostat to a higher or lower temperature based on your work hours, you can save money on energy bills without compromising comfort. Enjoy the flexibility and energy saving features that a programmable thermostat has to offer, contact Trident Air Conditioning and Heating today. How do I know when it’s time to replace my air conditioning system? If your find your air conditioning system needs repair more often or it is getting noisy, it may be time to consider a replacement. Any system over 10 years old is in the late stages of its life-cycle. There are variables that will influence the life expectancy of an air conditioning system such as the type of system, the climate and the regularity of routine maintenance. When the day to purchase a new unit comes, you will enjoy significant gains in operating efficiency and energy savings. Ask a Trident Air Conditioning and Heating professional for guidance on selecting the equipment that would work best for you.